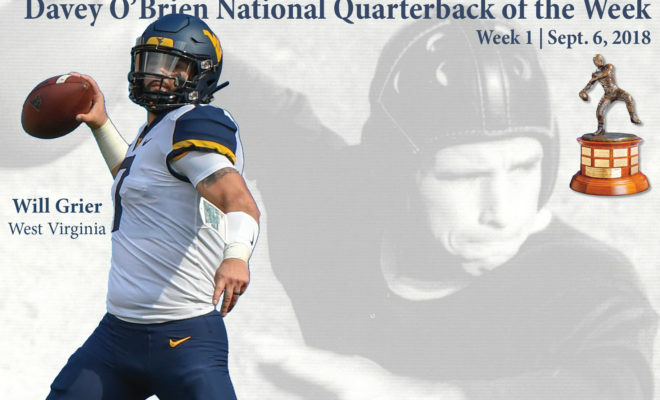 FORT WORTH, Texas (Sept. 6, 2018) – West Virginia senior Will Grier has been named the National Quarterback of the Week by the Davey O’Brien Foundation for his week one performance Saturday against Tennessee. Grier, the Big 12 Conference Offensive Player of the Week, threw for a career-high 429 yards and five touchdowns with no interceptions in a 40-14 victory over the Volunteers. He completed 73.5 percent of his passes (25-for-34) and finished with a pass efficiency rating of 228.0. It is the second time in his career that Grier has been named the Davey O’Brien Quarterback of the Week. He previously won the accolade on Oct. 6, 2015, while playing for Florida. Last year, Grier was named to the Davey O’Brien Great 8 weekly list twice and ultimately was a semifinalist for the Davey O’Brien National Quarterback Award. The other Great 8 quarterbacks in the season’s opening week were: North Texas’ Mason Fine, Dwayne Haskins of Ohio State, Hawaii’s Cole McDonald, McKenzie Milton of UCF, Oklahoma’s Kyler Murray, Jarrett Stidham of Auburn and Alabama’s Tua Tagovailoa. Eighty years ago, Davey O’Brien, a star quarterback for TCU, became the first player ever to win the Heisman Trophy, Maxwell Award and Walter Camp Award in the same year (1938). He was inducted into the College Football Hall of Fame in 1955. The Davey O’Brien Foundation was created in 1977, and the National Quarterback Award, the oldest and most prestigious college quarterback award, was first issued in 1981. The Davey O’Brien Fan Vote, now in its 12th year, will give fans a chance to play a role in determining the award winner. Fans may vote for their favorite quarterback at VoteOBrien.org daily beginning Sept. 10.